Pensacola State College was among four Florida College System institutions recently recognized for innovation and excellence by FCS Chancellor Madeline Pumariega. Pensacola State, Florida Gateway College, North Florida Community College and Polk State College received 2018 Chancellor’s Best Practice Awards from Pumariega. 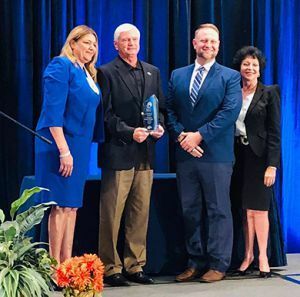 The four colleges were honored for programs of excellence at the Association of Florida Colleges’ 69th Annual Meeting and Conference in Orlando. Pensacola State was honored for the Bellwether Virtual Tutoring Program which has served more than a 1,000 students per year. The program provides services to students who might not have access to traditional tutoring methods by offering access to individualized services from any location or device with an internet connection. Pumariega said the Chancellor’s Best Practice Awards are an opportunity for FCS institutions to showcase innovative program strategies that have proven successful at their colleges and in their communities. 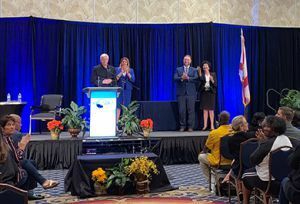 “The best practice awards recognize colleges for creating successful programs and then sharing the high-impact practices with all institutions in the Florida College System,” she explained. Florida Gateway College’s “Second-Chance Pell Pilot Program” which offers access to inmates to pursue an education so that upon release they will be better prepared to enter the workforce and provide for their families and themselves. The model enables rural dual-enrolled high school students to jumpstart their postsecondary education by using technology to keep them in their high school classrooms while offering them the opportunity to take classes at North Florida Community College. “I am extremely proud of all the North Florida Community College faculty and staff and our district K-12 school partners who make this invaluable videoconferencing classroom experience available to area dual enrollment students,” said North Florida Community College President John Grosskopf. Polk State College’s “Establishing Leaders in Teacher Education (ELITE Program),” a program that works to fill the increasing demand for qualified educators in Florida by creating a partnership with local public schools to help prepare baccalaureate students at Polk State College. Called the ELITE program, it provides a seamless pathway from high school to college to employment for aspiring teachers, helping students meet local workforce demands through an affordable fast-track pipeline. Polk State is thrilled for this recognition and I am extraordinarily proud of the college’s education baccalaureate program,” said Polk State President Angela Garcia Falconetti. Pumariega applauded FCS colleges for their commitment to excellence and innovation. “It is this commitment that keeps the Florida College System in the forefront as a national leader in higher education,” she added. For more information visit Chancellor’s Best Practice Awards. For more information about the Florida Department of Education, visit www.fldoe.org.